These are just a few of the countless named and unnamed victims of New York Police Department brutality whose arrests were recorded and have gone viral within the past few weeks. The NYPD is coming under increased public scrutiny this summer, but far less than it deserves. The recently filmed homicide of Eric Garner in Staten Island by NYPD officers set in motion a viral image of abuse of police power. 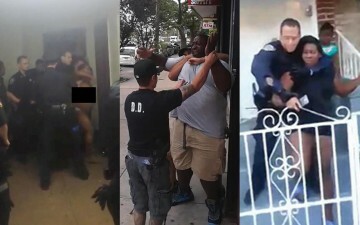 The video of Garner’s death joins a mounting pile of viral evidence that abuse of force police is not an isolated incident; rather it’s a system wide problem that needs to be addressed comprehensively. Much like the open casket portrait of Emmett Till in 1955’s JET, the cruelty of this video of Eric Garner being choked to death recorded could galvanize us to raise our voices against chronic abuse that for too long has been seen as isolated and disconnected. The abuse is not new, but our dialogue about it should be. The process of raising our voices against police terrorism won’t be an easy one which the family of Ramsey Orta—the civilian who taped the killing of Garner—learned this week when he and his wife found themselves “conveniently” under arrest and their names paraded across an national news media. Despite this, we cannot be silenced into to ignoring abuse of power. Not when less than a month after Garner’s death, we learn of two other Black men killed by police under circumstances that might have warranted a terse word for young Whites.